It’s been some time since I’ve perused through the XBLIG channel looking for some good co-op games to play. With the temporary lull we’re seeing in game releases leading up to all the excitement of E3, I once more turned to my attentions to the place where I had found so many great games before. I wasn’t disappointed, either. The first title I selected is one of the more entertaining games I’ve played these past few weeks. Rise of the Ravager, from Gentleman Squid Studio, builds upon the solid foundation that the 1980 arcade classic Missile Command established, and goes beyond with a few interesting gameplay mechanics of its own. Rise of the Ravager is set in some unknown period of time at the brink of a potentially catastrophic event. The Ravager, an ancient god, seeks to walk this plane of existence once more. Bad news is that he’d pretty much wipe out all life if he were to awaken (you know, how most of us initially feel on a Monday morning). You must prevent his revival by destroying his minions and avatars as they descend from on high onto a holy temple. If the minions manage to break through the protective shield and hit the temple, well, everything Venkman said about dogs and cats living together will come true. Fortunately, you’ve got a turret that shoots four different color bullets to stop those minions and drive back the evil. The Ravager, apparently, is big into color accessorizing his return. The four colors represented on the buttons of the Xbox controller – blue, red, yellow, and green – are also the four colors that the Ravager’s minions use. When a blue minion is coming down, shoot him with a blue bullet; shoot red with red, green with green. You get the idea. It’s a straightforward concept and you’re eased into the different colors across the first 10 stages of the game, with each new color getting its own little story tie in and (usually) an introduction to a new enemy type. Your level progression is saved, too, so you can come back and pick up where you left off at any time. At the conclusion of each level, you receive a number of skill points that can be used to help power up you and your friends. 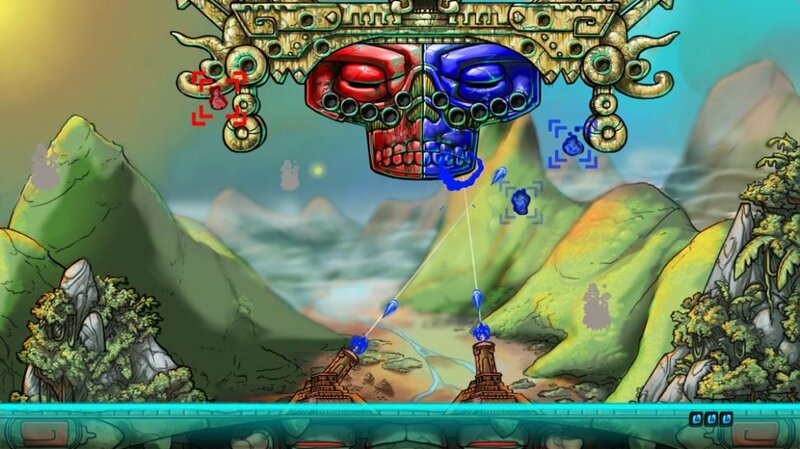 For completing a level, you get four points. You’ll get another point if no minions made it through your defenses and a possible two bonus points for shooting a “spy” ship that appears every few levels. These skill points can be spent to increase a few different abilities, such as bullet power and fire rate, and additional boons, like a bomb and an auto turret that provides some backup. The points you spend on these different abilities and boons can be refunded at any time, which allows you to change up strategies if you feel like you’re having a particularly difficult time on a level. That’s a possibility that may come up more and more by the time you hit level 10 and are being assaulted by waves of multi-colored foes. However, it is at this same point in Rise of the Ravager that the fun kicks up from around a 6 to a solid 9. Part of what I love about Monaco is the crazy chaos that ensues when you or one of your teammates is discovered and you all scramble in a mad dash to either get back to a cool heist, or just smash your way out. A piece of that chaos has been imbued into Rise of the Ravager as the waves of enemies start coming faster and tougher. Enemies that once took a single shot to kill now take two or three, which wouldn’t matter so much if there weren’t about 15 of his friends coming with him. Add in the color aspect, the different enemy types that descend in their own unique ways, and you’ll inexplicably find yourself shouting things like “red… NO! GREEN! GREEN! GREEN!” at your TV. Meanwhile, your hands will likely be mashing all the face buttons on the controller just hoping they’ll eventually hit the right button to fire the right bullet. These moments are well spaced so that a typical level after the 10th will have this continuing roller coaster feeling of build-up/insanity and then release/lull. If playing solo, these moments feel just manageable enough. If playing with a friend (or three), then these moments become spontaneous bursts of shouts and laughter as everyone works together to fight off the hordes of the Ravager’s minions. In other words: pure fun. 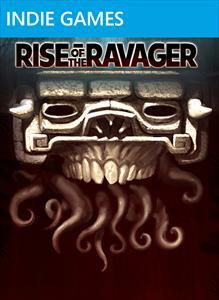 Rise of the Ravager is one of those games that made me fall in love with indie games in the first place. The base mechanic comes from a well-established design (Missile Command) and adds its own flavor and twist. These, too, are well executed and the overall result is a game that’s worth every bit of those 80 Microsoft space points. Co-Op Experience: Invite up to 3 friends to blast hordes of enemies utilizing a unique combat system based on color and prevent the rebirth of the Ravager. Page created in 0.9612 seconds.